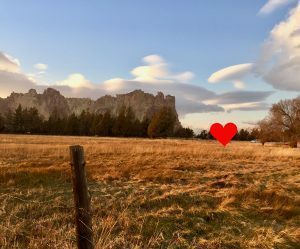 It is my amazing good fortune to have found and been able to purchase 10 irrigated acres directly adjacent to Smith Rock State Park a couple of years ago. (There’s a good story about that, but no room to tell it here. Ask me at the workshop! 😉 If you’re not familiar with Smith Rock – picture the Northern Lights, but rendered in curtains of stone. 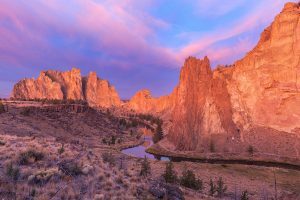 The crag rises full-blown out of the desert, excavated over millennia by the Crooked River, which meanders through this high-desert wonderland, rendering it verdant and full of wild life. Smith is one of the world’s pre-eminent rock-climbing areas, but there’s so much more: miles of hiking, mountain-biking, horse-back riding, bird-watching and more. We will be building at least one (maybe two) cabins and a garden wall, all with incredible views of the cliffs to the east and north and the mountains to the west. This is the only garden wall instruction being offered this year, so I hope you’ll join us! The earth-tones of the plaster will blend in beautifully with the backdrop of the Rock. The house will be sited where the heart is in this picture to the left. This first cabin will be my home and, because of the stellar location, the acreage, and having irrigation, it will be so much more! 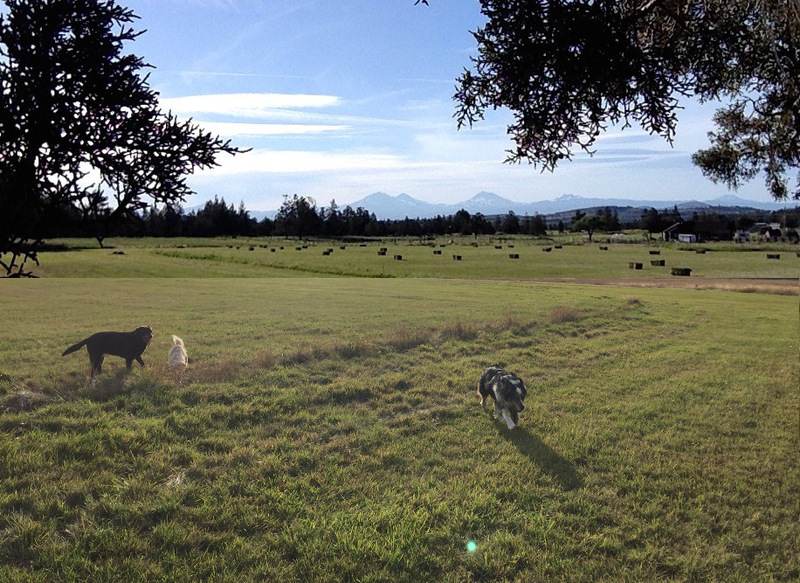 My east hay field already serves as the de facto neighborhood dog park, and I’d like to see that continue. 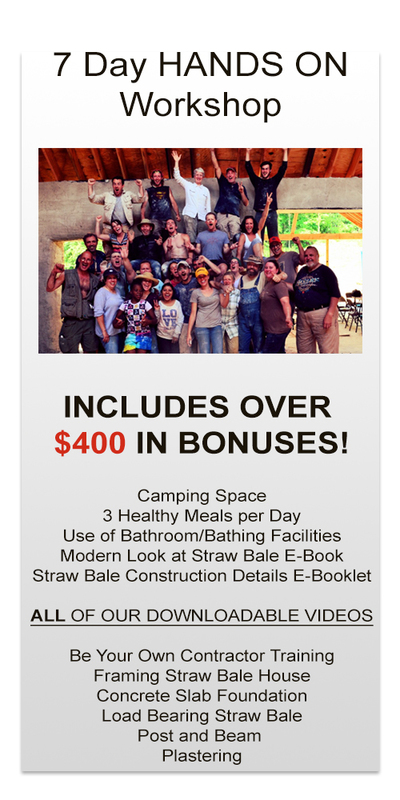 I’m already networking with some younger folks who might want to take advantage of the irrigation and “banana belt” climate in Terrebonne (which translates to “good earth”) to run an organic permaculture market garden. In fact, the house will be laid out to make it easy to share, if the farmers want to live on site. The second cabin will serve as an Airbnb rental. I’ve been running an Airbnb at my current residence for the last three years, and I really enjoy meeting and entertaining out-of-towners. The Airbnb will help provide funding for my passion: a small-scale farm animal rescue. So far, I’ve been donating the hay to a horse rescue, but once I’m out there, I can do so much more with a place like this! 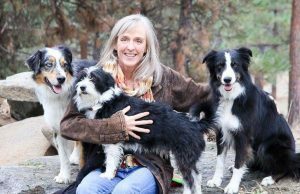 I love the idea of sharing my life with more species than just the three rescue dogs I currently have. I also hope to inspire kids and adults alike who visit the Airbnb to learn about treating animals with kindness and respect I hope to encourage them to make kind food choices in the future, whether it’s being willing to pay extra for humanely-raised meats, vegetarianism, or veganism. If you’re planning to stay in central Oregon and recreate after the workshop, you’d be more than welcome to use my property as a base, and I’ve got 2 mountain bikes and 3 paddle boards to lend. Also, for anyone who wants to try rock climbing, I’m a former guide, and would be happy to take beginners out after the workshop (or share a rope with non-beginners, too, of course!). The workshop dates span the Fourth of July, and there are numerous high spots nearby that will allow us to take in the firework displays of three different towns simultaneously, all while enjoying the serenity of the surrounding nature. The property has many old shade trees (one with a swing!) and acres of flat area for tents. The workshop was deliberately scheduled early enough in the summer to avoid the smokiness that sometimes accompanies fire season. And finally: the best cook I know has volunteered to oversee food production for the week, so we’re ALL in luck! The food on offer will be (mostly) organic, with both vegetarian and non-vegetarian (humanely-raised) options. I hope to see you at the workshop. I know we will have an amazing week together.